I've always liked drawing digital art with a computer more than doing it traditionally with a pen and paper, and as time has passed my preference to digital art has only got stronger. Drawing for me has been just something that I've done at random when I happened to have some spare time and an inspiration for a picture. I don't usually plan my drawings much but just start drawing something even with the briefest of inspiration and I'd say my best works come about with that sort of spontaneity. Two celestial bodies colliding violently with each other in a fiery explosion. In the background you can see an artistic interpretation of a waveform. In this image I tried to visually depict the kind of music I often compose and was going for a gritty drawing with an aggressive event happening. I drew this image as a banner for the music page on this web site which explains its strange resolution. Since the image was scaled down so much there I wanted to upload the original HD-version of it as well to show the details better. A landscape which is illuminated by the first rays of the morning sun as well as the fading flame of a lantern. 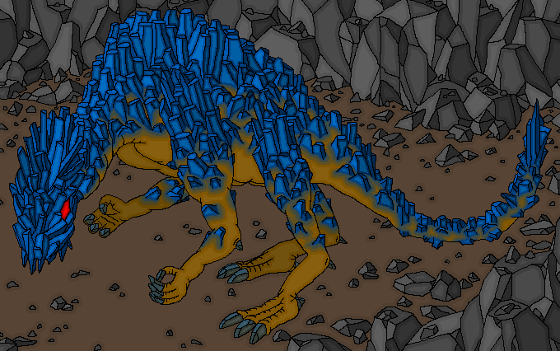 I drew this image as a banner for the drawings page on this web site which explains its strange resolution. Since the image was scaled down so much there I wanted to upload the original HD-version of it as well to show the details better. 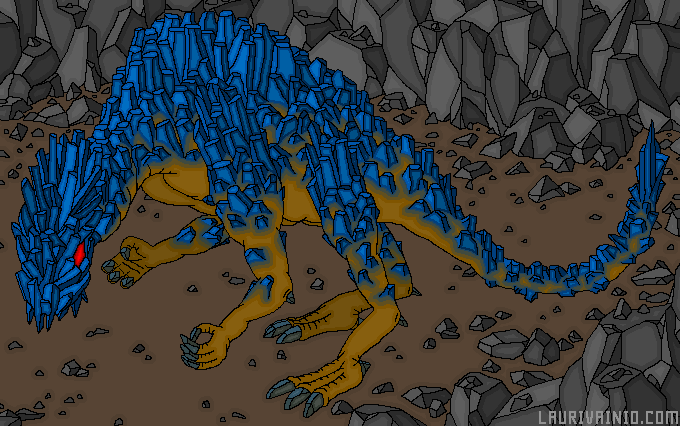 A lizard-like monster with blue crystals growing from its back as a form of camouflage. Here it is pictured outside of its natural habitat. I've used MS Paint the most for this purpose mainly because the program has been so quick to open, easy to use and perfect for getting an idea out of my head into a visible form. For a long time I used a mouse for drawing pictures but as my hobby continued further I also started using a tablet. I think, for art purposes, be it just drawing or animating, a tablet with a pen is often more efficient and comfortable than a mouse. Later on, I learned to use a more professional program called Gimp and made some images with it. Still, it most certainly didn't replace Paint for me because of the heaviness and clumsiness of the program compared to the simpler alternatives. Surely with Gimp you can do fancier and more ambitious pictures but, I myself, really like the pixelated look you'll usually get with programs like Paint. Sometimes I do though use the powerful image manipulation features of Gimp to put the final touches to the images I've drawn in Paint. Lastly I have to say though, that in my opinion, the new version of MS Paint, which was first released in Windows Vista, is greatly inferior for various reasons compared to the older version of the same program which was found in Windows XP and earlier operating systems. Thankfully I was able to copy the XP-version of Paint from an old hard drive so I can continue to use that awesome pixel art creation machine.